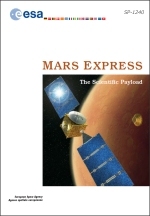 The instrument PIs and ESA scientists have joined efforts to produce an ESA special publication (SP-1240) devoted to the science instruments onboard the Mars Express mission, both on the orbiter and on the lander. Prior to the release of the complete ESA SP-1240 publication, the individual chapters were made available for download. These can be retreived by clicking on the corresponding PDF links in the overview below. Since August 2004, the complete publication is available on-line as a single PDF at ESA publications, which can be accessed through the link "ESA SP-1240" in the right-hand menu.